This antibody was developed and affinity purified using a peptide based on human MEK1. 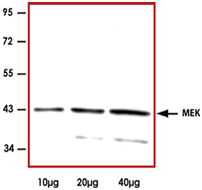 This antibody was tested to be able to detect both human MEK1 and MEK2 using human cell lysates. Representative western blot with anti-MEK1/2 (1:1000) using, from left to right, 10 µg, 20 µg and 40 µg of 293 cell lysate. MEK1 is a member of the dual specificity protein kinase family that acts as a mitogen-activated protein kinase (MAPK) kinase. MEK1 lies upstream of MAPK/ERK and stimulates the enzymatic activity of MAPK/ERK upon a wide variety of extra- and intracellular signals. As an essential component of MAPK/ERK signal transduction pathway, MEK1 is involved in many cellular processes such as proliferation, differentiation, transcription regulation and development.